Much of this week’s news revolved around the highly-anticipated S&P/Case-Shiller Home Price Index, which was released Tuesday. Great news or much ado about nothing? Here are the other real estate investing related news items that caught our attention this past week. We hope they help you stay up-to-date with your real estate investment strategies and inspire some profitable real estate deals for you. 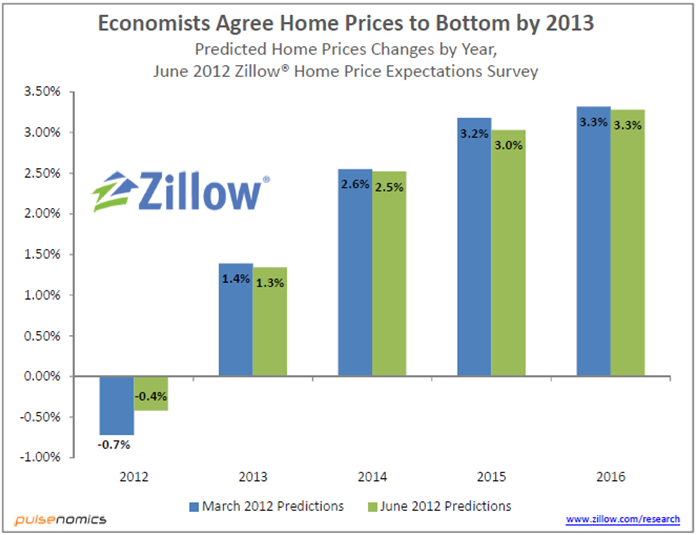 “The June 2012 Zillow Home Price Expectations Survey reveals that economists agree that home prices will decline only slightly in 2012 and expect to see a bottom in home prices by 2013…. “New home sales jumped to 369,000 in May—the highest level since April 2010—as the median and average home prices both dropped, the Census Bureau and HUD reported jointly Monday. “Home prices typically show a seasonal gain in April, and Tuesday’s report from the S&P/Case-Shiller index was no different. Home prices were up 1.3% from March for the 20-city index. After adjusting for seasonal factors (more homes generally sell in April), prices were up by 0.7%. This year was clearly better than April 2011, when monthly prices rose by 0.7%, and when adjusting for seasonality, they fell by 0.1%. Read this article to see RealtyTrac’s analysis and bank ratings. “Pre-foreclosure sales (typically short sales) increased to a three-year high in the first quarter of 2012 even as the average pre-foreclosure sales price reached a record low — making 2012 a prime time to purchase a short sale. “Overall, managers reported they are doing better than the year before and are having an easier time attracting in residents despite the increase in prices.